It’s another damp, chilly rainy day around here. The kind that has a tendency to make bones ache and creak a bit, lol. It also happens to be a maintenance day, and combined with some rl stuffs that translates into a very limited game play window later this evening. I pretty much like maintenance days, they provide opportunities for me to get into some in-depth blog reading, research of whatever’s got my attention and a host of incidentals. I go over “plans” I’ve made for various characters’ activities and generally attempt to get myself (organized?). Major challenge there! Slightly serious though, with the vast amount of content offered and three level 90’s scurrying about soaking up as much as possible, we do need a better “Plan A”. We’ve got plenty of B’s, C’s and D’s in operation 🙂 Anyway, it’s something we’ve been working on this past week. Time, is a valuable commodity and we need to use it well. Hence, no more running all three through a slew of dailys, everyday, for the sake of valor points. After all three have cared for their farms and gained their Ironpaw token for the day, one will get the call for a dailys run and they’ll switch off each day. This will leave time for one or both of the others to work on different projects. For example, Thdoria is the least geared of the three. On her off days from dailys, she could be venturing into some dungeons. Scary, but more effective I should think. Ay could really spend some more time farming his much needed ore stocks. Dufit could at least learn how to not get “chomp-chomp-chomped.” After all, he spent 1600g getting that invitation. And of coarse, we’ve got the whole profession things going on. Blacksmithing, Alchemy, Tailoring and Enchanting are all skill capped. It’s high time to start making some money off of them, for all the efforts and money put into getting them there. And I happen to know a few alts sitting around gathering dust who could use a little helping hand. Now then, I’m not very gold making knowledgeable, or an AH player. I know enough to use the Undermine Journal, and I do follow a few select gold making blogs. My AH history has been marginally good because of this, and a handful of luck tossed in. I do realize though, that this is a viable part of the game that provides some nice rewards. So along with some encouragement from blog readings, we’re going to venture into some attempts to fill our coin sacks to a “comfortable” level. Our first inspirational steps came to us by way of reading Nev’s “20 Days of Goldmaking”. Formally considered useless for us, we’ve now installed Auctionator and LilSparky’s Workshop. It’s kind of like wiggleing your fingers in the bath water for a temp check before you climb in. Hopefully, our limited game play time this evening will allow us to get them configured. I certainly don’t expect to compete with the real gold-makers of Fenris, but I do have my sights set on becoming “comfortably wealthy.” Lol, I’ll let you know how much that is when I get there!!! It’s been quite a day in Azeroth, both interesting and challenging. Having briefly mentioned in previous posts about having several projects going on, today was one of those “work-on-UI” days. Up until the past couple of weeks, I’ve had my UI pretty well established. All neat and pretty-like, comfortable to work with and useful across all characters. Keybinds were stable, only adjustments of which spells went on which key was needed in the beginning. I had this “Default” profile on most things that everyone used. Pretty simple. Right? I’ve used Pitbull4 unit frames forever it seems like. 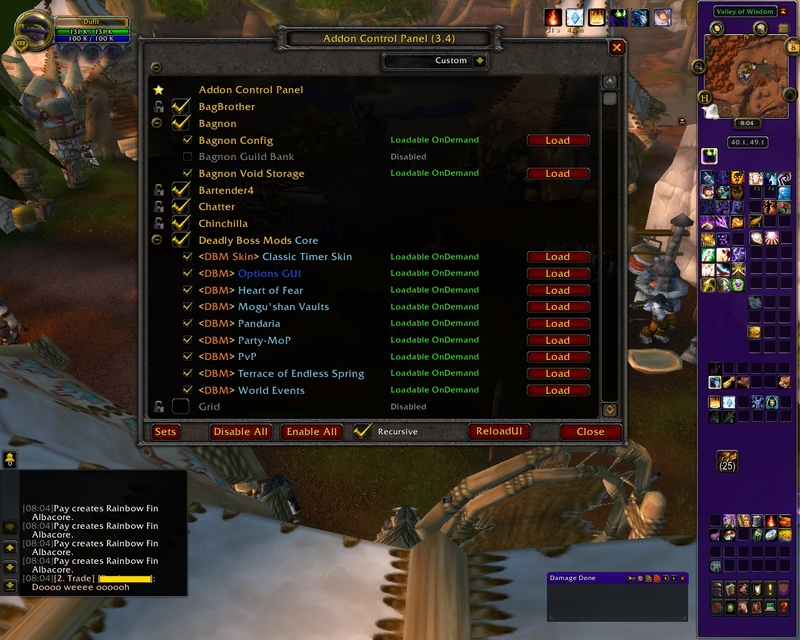 One rule I go by, “if it ain’t broke, don’t fix it.” Then I got into learning serious tanking with Killona. Started to notice some small changes were needed, nothing too serious, just little things popping up now and then. Then, I decided (perhaps foolishly), to attempt learning the Healing trade. Now, we have some serious problems with unit frames. My baby healer needed something more suitable, more useful, to figure out what she’s doing. 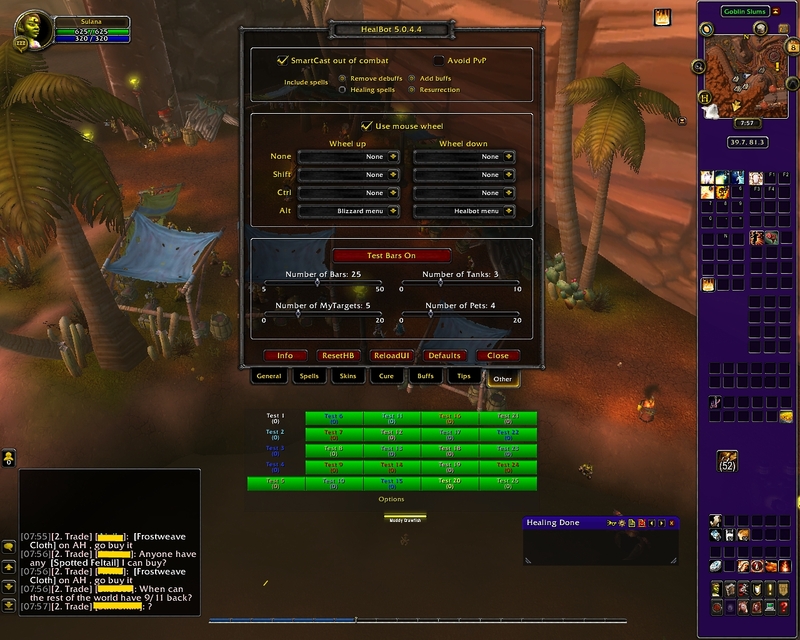 Luckily, somewhere along the line in the past, I had installed this Addon Control Panel mod. It is certainly getting it’s workout time in now! “ACP”, an in-game time saver! I started with an old favorite, Grid. Still trying to get the configurations figured out so far. It’s a contender for Pitbull replacement, but questionable. Then I gave HealBot a look over. I’m getting a bit further along with it than I did with Grid. I credit the HealBot website for the progress I’ve made so far. They have some good info available on set-ups, including some videos. Neither of these unit frame mods have been on trial runs as yet. It looks like Healbot will get the first opportunity. My baby healer is level 14 atm. She chose to start her healing practice in battlegrounds today, using the stock raid frames. That’s a story for another time though. Tomorrow, we’ll be back to touching up the Healbot, and giving it a trial run. If you happen to be a Healer with some insight about these unit frames, feel free to add them to your comments.